The much-anticipated addition to the Shorter University library opened this fall and on Friday, Sept. 14, was officially named in honor of longtime Trustee Chairman Dr. Nelson Price and his wife, Trudy. The University hosted a preview event on Thursday, Sept. 13, for faculty, staff and students to celebrate the new addition with the Prices. 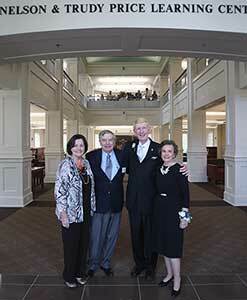 A formal dedication ceremony and reception was held on Friday for donors and friends. 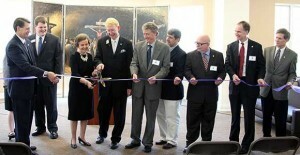 The 18,000-square-foot addition was designed after a basilica and features a two-story cathedral atrium. The breath-taking facility has become a showpiece for the Shorter campus. 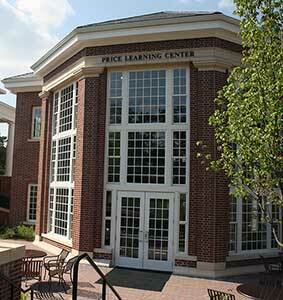 Featuring a Starbucks coffee shop, a fireplace, and plenty of comfortable seating, the Price Learning Center has greatly increased the library’s ability to attract students. Cooper Carry of Atlanta was the architectural firm for the project with Tim Fish serving as the lead architect. As in many buildings that Fish works on, the library features a fish-shaped design element. For the Price Learning center, he chose Christian fish-style accents for the second-floor railing which also serve as a tribue to Shorter’s Christian mission. Dr. and Mrs. Price have also generously donated a collection of books and artifacts they have collected over many years of ministry. The artifact collection includes a page from the original Gutenberg Bible; stones from various locations in the Holy Land, including Mount Calvary; and personal treasures including the first Bible used by Dr. Price as a preacher. The artifacts are housed in a display case on the second floor of the Price Learning Center. © 2012 Dr. Nelson L. Price All rights reserved.